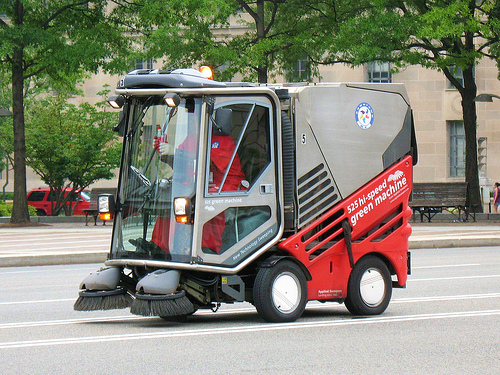 The Downtown BID isn't just good for creating WALL-E looking street sweepers. They're also the business communities chief advocates for urbanism. Photo by Mr. T in DC. I wrote a couple of days ago about the need for smart growth advocates and urbanists to get smarter about playing the inside game. We’re winning the messaging but then losing behind closed doors, I argued. So I was particularly intrigued by a report in this week’s Current about the Downtown BID publishing a new report, “Getting From Here to There,” all about transportation improvement. Business is always a powerful political force and seeing what its priorities are is important, because business plays to win. The report turns out to be extremely good. In the introduction, the report credits D.C.’s transportation system with the bulk of its competitiveness relative to outlying jurisdictions. When the BID argues that new developments in places like Navy Yard, NoMa and Anacostia need better connections to downtown, the answer isn’t more roads at all; rather, “freeway segments, a lack of continuous street level activity and inadequacies in the current surface transit service supply and delivery” are the obstacles. The BID is urbanist! More specifically, the report has four broad goals. The first goal is to integrate all the different strategic plans for D.C. Rather than having a Transit Alternatives Analysis and a National Parks Service plan and a Great Streets plan, there should just be one. That makes sense, though good luck on achieving that kind of bureaucratic streamlining. The second goal is improving transit. This is broken down into building four streetcar lines, an undetailed promotion of BRT and rapid bus expansion, and more Circulator coverage between downtown and sites on the Mall. The third goal is reducing congestion, which they propose doing by redesigning K Street, expanding the management of goods and service delivery (regulating double-parking by delivery vehicles and so on), regulating motor coaches and Chinatown buses and instituting performance pricing for parking. Finally, the BID proposes financing all of this through value capture around transit improvements and dedicating the funds raised from increased tolls and parking fees to transportation. While this isn’t a perfect transportation program for the District, it’s remarkably close. There’s absolutely nothing on here that’s objectionable. It’s incredible. In the Current article, Councilmember Graham, who chairs the transportation committee, does warn that there isn’t necessarily the money for all of these improvements. Even so, having all this business support should go quite a long way in reshaping the D.C. transportation system, right? The Maryland Chamber of Commerce seems a bit better, opposing strong measures like mandatory reductions in VMT or large raises in the gas tax and strongly supporting the ICC but supporting TOD bills and modest gas tax increases. The Virginia Chamber puts their issues page behind a members-only wall, so that one’s hard to say. And then at the federal level, the Chamber of Commerce is perhaps the foremost right-wing force in the capitol. The U.S. Chamber is a major proponent of just plain spending more on transportation, but their emphasis is on how to most efficiently move goods without hitting traffic. The last however many sprawl-inducing highway-building transportation bills have been just fine with them. As a movement, urbanism probably isn’t strong enough to withstand the combined opposition of the entire business community. Luckily, we don’t have to. We just have to figure out how to help the Downtown BIDs of the world speak louder and convince both our elected officials and their colleagues in the business community. Hopefully this brief guide to where local business advocacy organizations stand on transportation issues is a helpful first step in that process. Tags: BID, bus rapid transit (BRT), business, Chamber of Commerce, circulator, congestion, D.C. Chamber of Commerce, downtown, free parking, freight, k street, metro, metrorail, project financing, revenue, reverse commuting, streetcars, taxes, United States, urban mobility planning, value capture, Washington, D.C.